Brace yourselves, allies! 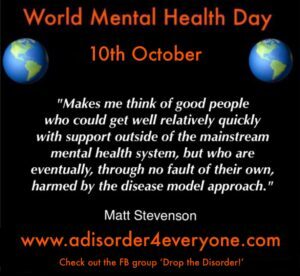 Our very favourite day of the year is nearly upon us – that annual shout out for all things ‘illness model’ that is World Mental Health Day. The day when schools get speakers in to talk about recognising ‘symptoms’, where radio stations host phone-ins about various ‘conditions’ and the internet proclaim en masse that ‘one in four’ of us will experience ‘mental illness’ at some point in our lives. You would be forgiven for thinking that this is a great choice. There are, after all, many important things to say about the severe emotional distress that young people are experiencing in this ‘changing world’. In fact, I’m not convinced I’ve met a young person who hasn’t, at some point really struggled with just being alive! Let’s face it, it’s not easy. Unprecedented numbers of young people are being or have been sexually abused/exploited, emotionally neglected and /or are living in abject poverty with no sense of security or safety. Many are experiencing overwhelming pressures to ‘succeed’ or to visually present like an airbrushed, size zero Disney Princess with little or no access to even basic affirmation or encouragement for who they actually are or could be. In fact, many have multiple vacant positions for positive attachments that are proving to be difficult, if not impossible, to fill. Is it any wonder that many young people are fighting to survive and using all available strategies in the process? But I digress. So, this is a great choice of theme – right? “Fortunately, there is a growing recognition of the importance of helping young people build mental resilience, from the earliest ages, in order to cope with the challenges of today’s world…. Thanks to research as well as common sense, we know that the biggest causal factors for emotional distress are social factors such as poverty, abuse, racism etc…. (the list goes on) and we therefore have a good idea of what prevention may look like – right? 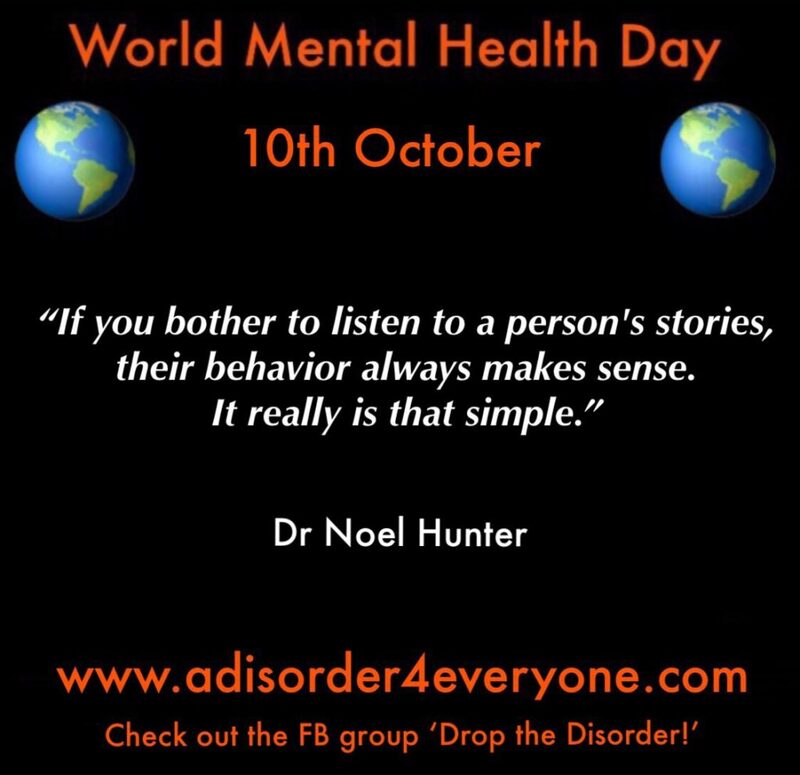 (Quotes are taken from the World Health Organisation website). As many of us know, this misinformation translates directly to far too many people internalising a belief that they are ‘ill’, that they have a faulty brain or genes and that this is the explanation for their distress. What happens then, to what actually caused the suffering. 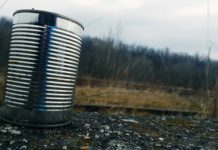 Where do all the stories go? 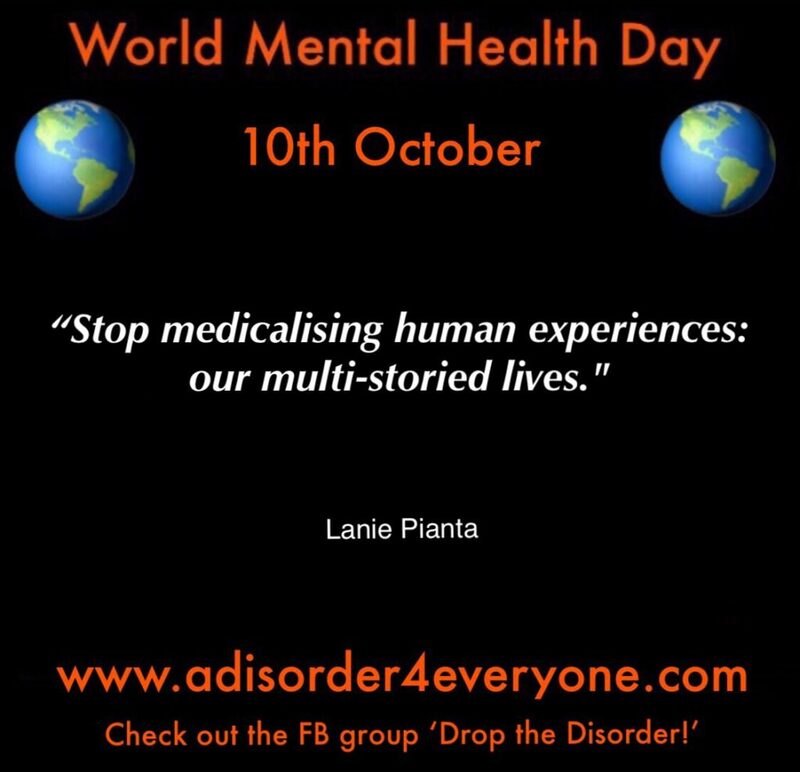 The World Mental Health Day message of illness and disorder is the same one that informs all the ‘anti-stigma’, ‘illness like any other’ messages of the mainstream mental health organisations. It’s all pretty much wrapped up and it’s very convenient for governments who refuse to take any responsibility for the actual causes of severe emotional distress. 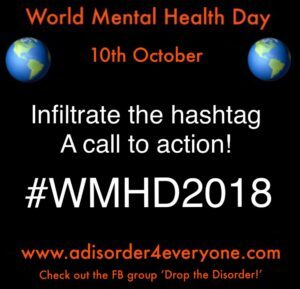 I remember many despairing conversations with allies on social media in previous years, as we anticipated the pathologising that World Mental Health Day inevitably brought with it. But last year, inspired by the tragic suicide of our friend and ally Matt Stephenson, we tried to do something different. The ‘something different’ came in the form of a meme campaign that aimed to offer alternative messages to the World Mental Health Day hashtag and I’m suggesting we do the same again. Check out last years call to action blog I wrote for Mad in America. As I stressed in the above article, I do acknowledge that this is a tiny protest in the wider scheme of things. However, it is important that there’s some attempt at making alternative understandings visible on what is indisputably a massive hashtag and platform that reaches millions of people over the course of a week or more. Last year I received several messages from people who wanted to know more about the discussion and we had a surge in membership of ‘Drop the Disorder’ which may have been at least in part a result of some of the memes resonating with people. So, for the second year, this is a polite call to action! Please get retweeting on Twitter or sharing on Facebook or Instagram when you see the memes and please add your own quotes, tweets, memes, articles and so on whenever and wherever you can. It all helps. 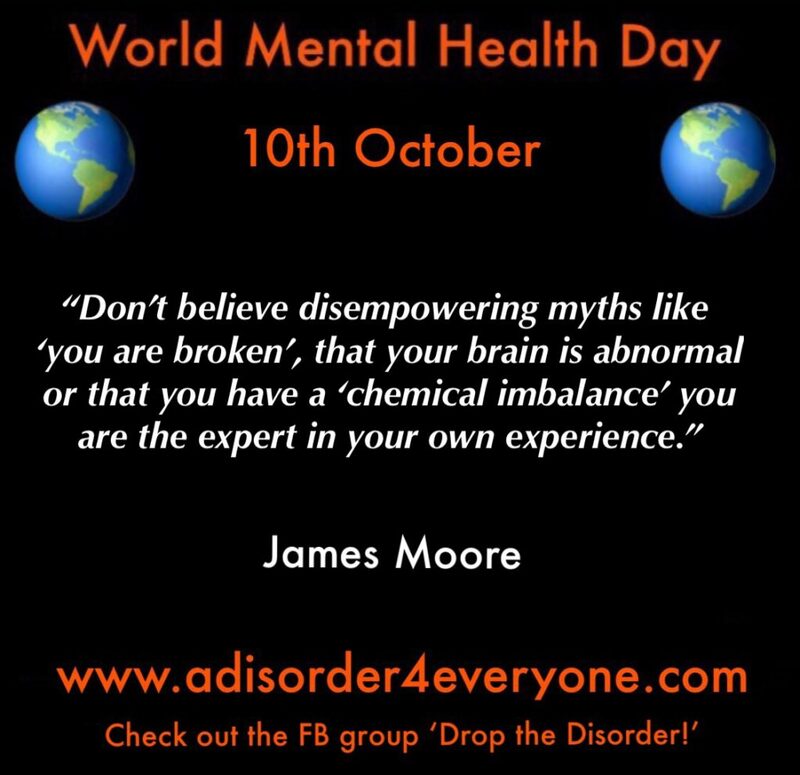 Let’s try to get some other messages out there that challenge the old, tired, damaging narrative of diagnosis and disorder. 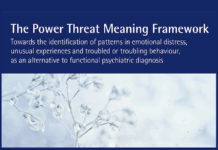 Messages that offer hope and solidarity to people and messages that put the responsibility for the primary causal factors of emotional distress firmly back where it belongs. “…Who could get well relatively quickly..” – is exactly true. Dr Peter Gotzsche described “schizophrenia” as this type of situation.